Not surprisingly, the first thing that comes to mind when one thinks of camping is a tent! Tents are classified by size, material, weight, weather durability, etc. They range from cozy single occupancy to multi-room structures with several entrances. Below are some basic types of tents. Additionally, consider a tarp: While the tent is very important, the tarp is too. Although not particularly a necessity, tarps can protect the tent from tears by rocks and rough terrain below, and also from wet and soggy ground. Dome tent: The dome tent (A) is the most popular type of tent for casual campers. Two to three curved poles intersect at their centers to support this tent. Dome tents are free-standing structures that can be picked up and moved versus staked down. They provide plenty of head room compared to the footprint. Hoop tent: Similarly to the dome tent, the curved structure of the hoop tent (B) allows precipitation to slide off of the tent. Hoop tents consist of arches of poles arranged in series. A-frame tent: The A-frame tent (C) is simple and classic. A single horizontal ridge pole is supported by two poles on each side that meet at an apex. A-frame tents are less roomy because of the steep sloping sides. The forecasts for our desert destinations called for a whopping 0.5” rain per month so we anticipated little need to shelter from rain, sleet, or snow. 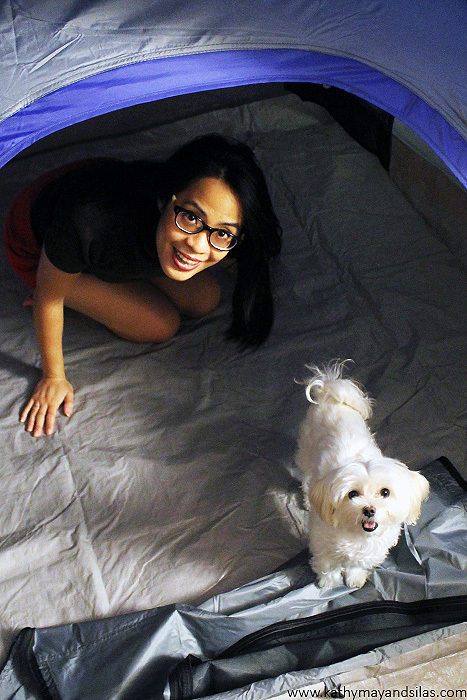 We purchased a three-person tent which is ample room for just the two of us, our equipment, plus Mimi when she joins us on future trips. We also opted for a heavy-duty polyethylene tarp similar to what we use on the Habitat for Humanity construction sites. While ground moisture was less of a concern for the present trip, the tarp protected from rocks that may cut the tent. When it comes to staying warm, the sleep system is one of the most important factors of camping. We prioritized this for two reasons: Firstly, the desert’s lack of humidity prevents retention of heat radiating from the ground after the sun goes down; this means that it gets cold at night! Secondly, Kathy May is always cold no matter what! Thanks to the warm sleeping bags from Silas’ parents and from Kathy May’s medical school friend, Sam, we were able to save a few dollars for this trip. We did, however, investigate sleeping pads. These are certainly not a necessity; however, they’re not exactly a luxury either, especially on camping trips that are days-long. Look for the “R-value” which denotes insulating capacity. 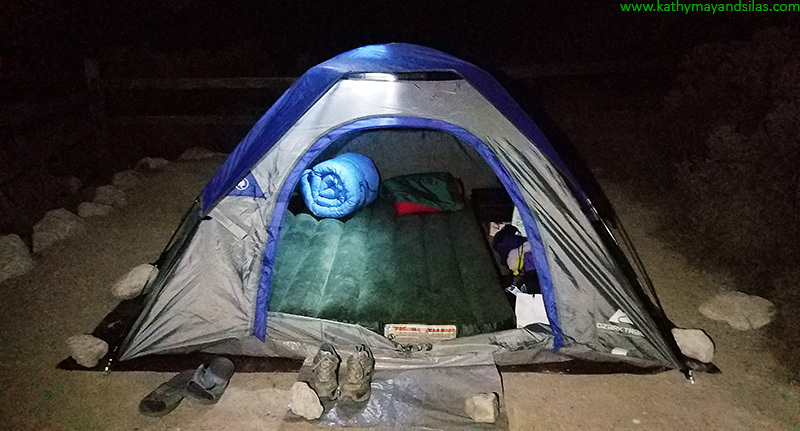 In addition to providing warmth, sleeping pads also ensure better rest and comfort, a reward after days of grueling hikes and exhausting travel. Air: Inflating sleeping pads (A) are the most comfortable of camping sleeping pads. Some disadvantages include poor insulation, need to pump or blow up, and, most of all, propensity for puncture and leakage. 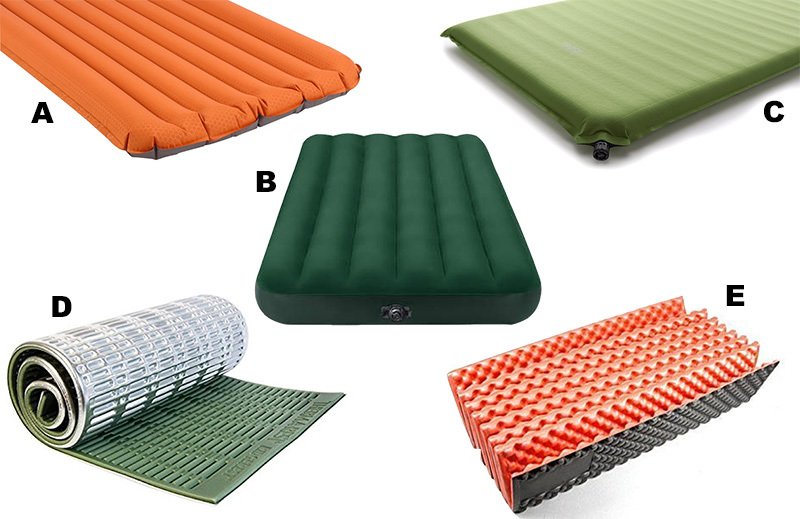 Camping mattresses (B) are hybridized with air mattresses. Creative alternatives include pool rafts or floats; interestingly, many inflatable sleeping pads are advertised to double as flotation cushions! Self-inflating: To use a self-inflating pad (C), roll it out, open the one-way valve, allow air to enter, and then close the valve. These are not as thick as air pads and are therefore less comfortable; however, they are more compact and light. Closed-cell foam: This dense material is designed to prioritize insulation over comfort. They are no-nonsense – just open and use – and can also function as sitting pads. On form is (D) an roll-up style; another is (E) accordion style. Creative alternatives are yoga mats, Kindermats, and interlocking foam tile or puzzle mats. Alternatives: Cots are a possibility, or even simply pillows, blankets, and comforters. Most basic of all is the classic pile of boughs and leaves (that are placed under your tent, of course), which provide both cushion and insulation. In honesty we scoffed when our friends mentioned that campers bring air mattresses to the great outdoors, but we surprisingly settled upon a camping mattress, which is just that! 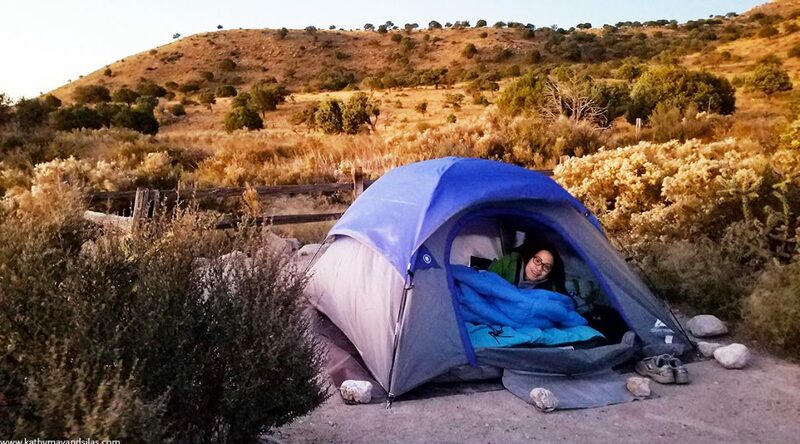 Our single height, full-size camping mattress is a cheap, simple option that ensured comfort over a week of sleeping on the ground, in a desert environment without soil, grass, or leaves to soften our slumber. It has a battery-operated pump for inflation in minutes. In case you’re wondering (we were) – no, the romantic idea of cooking over the fire is not advisable… unless you are just roasting marshmallows. It is inefficient and will burn cookware! Burying foil packets in mature coals is possible, but at the risk of carcinogens. Camp stoves are a much better idea. There are many options, with considerations of your desire for a home-cooked meal versus just boiling water, as well as factors such as portability, weight, and fuel. 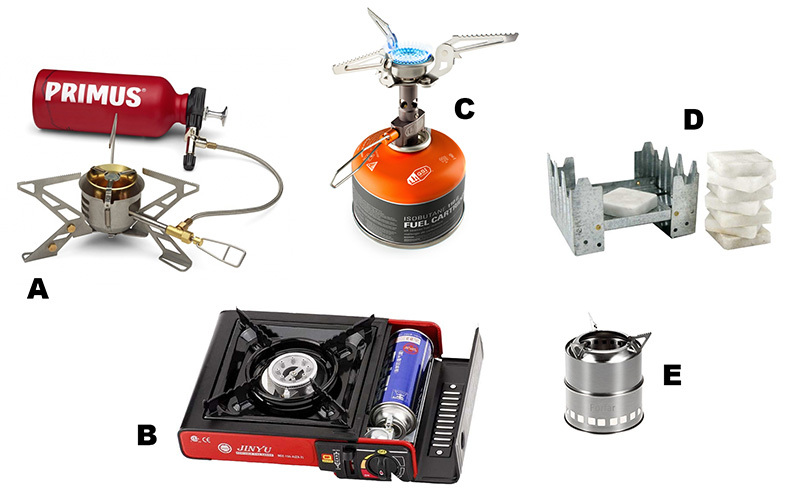 Petroleum stoves: Petroleum stoves (A) are fast and effective, even at very low temperatures; however, they may not be ideal for backpacking because of their weight and bulk. They utilize easy-to-find white gas, kerosene, jet fuel, or even gasoline that is poured into a reusable fuel canister and then pressurized by hand pump. It’s easy to see why these can be messy and dangerous! Liquid gas stoves: These are easy to use and efficiently utilize pressurized butane, isobutane, or propane with a clean burn; however, fuel can be expensive and canisters are not refillable. Tabletop burners (B) are analogous to gas ranges with which we’re familiar – the fuel container screws into the system. 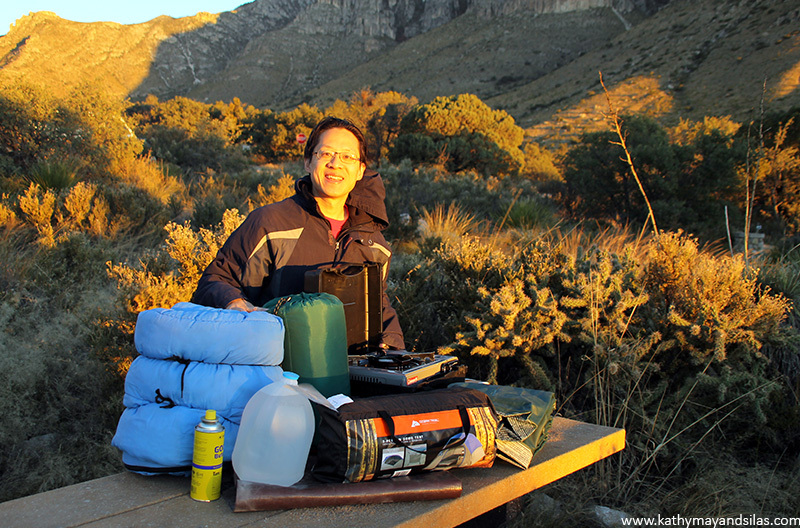 Alternatively, canister stoves (C) are great for backpacking – the stove screws directly onto the fuel container. Chemical solid fuel stoves: Of all the options, this is the most simple, small, and light. Many stoves are even foldable (D)! Fuel tablets, or small blocks of organic compounds (hemamine, Esbit, Triox, and more), are burned. Unfortunately, each tablet only lasts a few minutes, does not generate much heat, and can leave a brown sticky residue on cookware. Alcohol stoves: Alcohol stoves (E) may utilize cans that look similar to the heat element under the chafing dishes at catered events. Or, they can even be homemade from tin or aluminum cans! Though they are simple and clean-burning, they do not generate a great deal of heat. 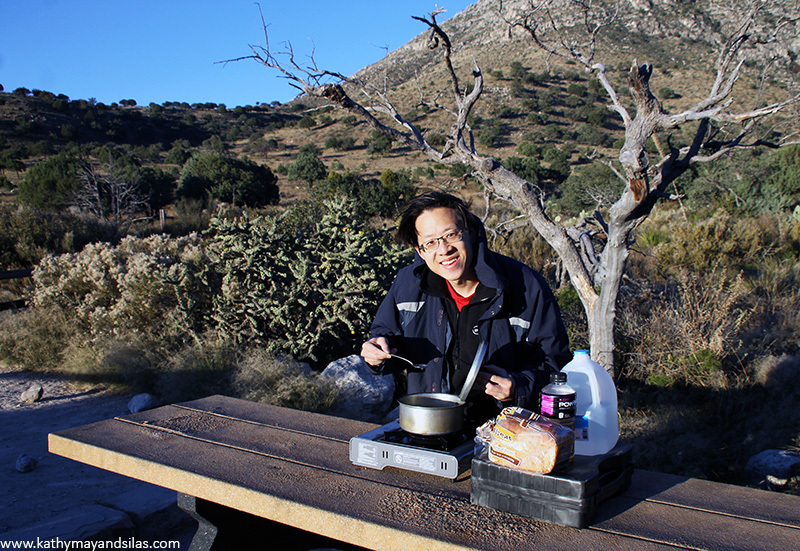 GORP: Especially with car camping but even with backpacking, camp stoves are not a necessity! You could always go with “good old raisins and peanuts” and other foods that don’t require cooking or refrigeration. Breads, peanut butter, canned meats and fish, cereal, bars, are some ideas. Don’t forget to stash some chocolate, candy, cookies, and cake! We opted for a simple tabletop butane stove with a single burner, effective for boiling water and heating foods in a small pot. Screw the canister into the stove, turn the dial, and then light! A lamp with a hook is very helpful. It can be hung from the inside of the tent for illumination while you’re in it; while it’s hung the tent will glow to provide ambient light while you’re outside of it. It can also be carried with you during short walks. We also prioritized bright handheld flashlights with wide fields to light our way. In addition to standard sized flashlights, we also carried smaller convenient cylindrical flashlights to easily stash in our bags and pockets. We brought along a tactical flashlight, too, given to us by Kathy May’s brother Tom-Vinh. We found head lamps incredibly useful. Being hands-free allowed us to pitch our tent, cook food, explore caves, and go on short walks to the washroom in the darkness. They virtually obviated the need for handheld flashlights (though, once again, it was helpful to keep a mini cylindrical flashlight for convenience in case we didn’t have access to our hook lamp or head lamp. When strapped to a water jug, they also provided great ambient light similar to another lamp. Electricity: Our destinations were very remote, sometimes miles away from electricity and cell phone signals, and hundreds of miles away from cities. However, being the unfortunate modern creatures we are, we needed some volts to charge our electronics. Electronics that we brought included: Mobile phones, camera batteries, dash cam, action cam. We also brought a small netbook to transfer the thousands of pictures we take from memory cards to a portable hard drive. An car AC power inverter is one of the best car-related purchases we’ve made (for camping and not). It plugs into the cigarette lighter and provides DC-to-AC sockets, as well as additional USB charging ports and a 12V cigarette lighter socket. Ours is even shaped to fit into the cup holder. We couldn’t run our car all the time to run the AC inverter, so we brought our rechargeable high-capacity battery pack for emergency power (mostly our mobile phones). Don’t forget to put your phone in airplane mode if you’re remote with absolutely no signal to prevent unnecessary power depletion. You’ll need to consider alkaline versus rechargeable batteries for your lights, pumps, walkie talkies, etc. First-aid kit: This list seems extensive but one can tailor the supplies to his/her particular trip and pack it in a compact area. You should consider the following. First-aid supplies such as adhesive bandages, gauze, antiseptic topicals, antibiotic topicals, sterile wipes and rinse. Topicals such as hand sanitizer, soap, sunblock, sunburn relief, bug spray, sting relief. Medicine such as ibuprofen, acetaminophen, hydrocortisone, antihistamine, Epi pen, anti-diarrheal meds, antacids, cough drops. Don’t forget your typical prescription meds too. Miscellaneous supplies such as surgical gloves, tweezers, safety pins, scissors, scalpel, utility knife, duct tape. Campfire: Though it’s a core idea of “camping,” our desert destinations banned campfires for obvious reasons. We’ve received a good deal of advice on campfires but thus far do not have firsthand experience; we’ll update this as we try it out in the future! Well, there you have it! That’s basically everything that we know about camping so far! We are mere novices (as suggested by the fact that we went car-camping as opposed to backpacking). Surprisingly, it can be expensive to live in the wilderness, and some equipment is costly. 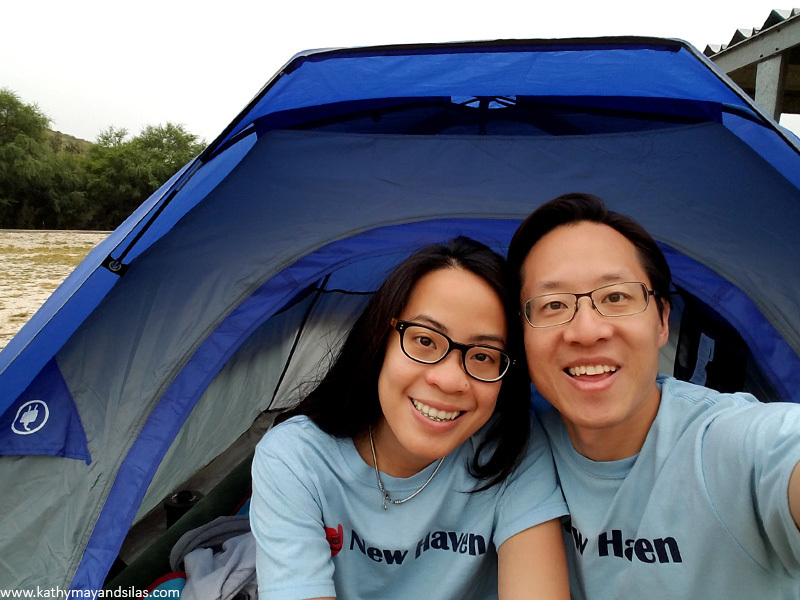 However, most equipment requires one-time investments only, or gadgets that we use in our everyday lives anyway, so we were able to find a budget-friendly way to be comfortable during our camping road trip! If you have any tips on frontcountry camping, please do share them below in the comments! We would appreciate more tips and learning from you!